Calling all corporations, small businesses, government and nonprofit organizations! 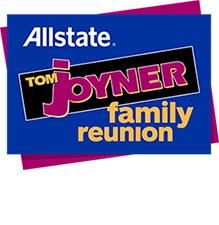 Join us as an exhibitor Labor Day weekend, Thursday, August 30th – Sunday, September 3rd, in Kissimmee, Florida for the 2018 Allstate® Tom Joyner Family Reunion – Allstate® Family EXPO! Please note that vendors CANNOT purchase booths through any other entity EXCEPT directly through Reach Media Inc. OR Star 94.5 Orlando, our local radio station affiliate. NO other entity is authorized to sell booths and we DO NOT ALLOW any food vendors on site. Exhibitor Questions?Need More Information on Becoming A Vendor? Thank you for your interest in the 2018 Allstate® Family EXPO!